Ford partnered with the Virginia Tech Transportation Institute in August to test how people reacted to a self-driving vehicle signaling its intent. WASHINGTON -- Ford Motor has designed a light signal system for autonomous vehicles that company officials say helps solve the problem of self-driving cars safely interacting with pedestrians, bicyclists and human drivers. Ford engineers said they hope tests results from real-world encounters will pave the way for standardization and industry-wide adoption. “At Ford, we don’t see this type of feature as a competitive advantage, but something that’s necessary for society to accept these vehicles,” John Shutko, Ford’s human factors technical specialist, said in a briefing for reporters here. The cue for yielding to a full stop is two white lights that move side to side. A rapidly blinking white light indicates the vehicle is beginning to accelerate from a stop and a solid white light means the vehicle is driving under computer control. Ford researchers ruled out displaying text messages or symbols because of potential language or recognition challenges. Light signals for turning and braking are already standardized and universally accepted. 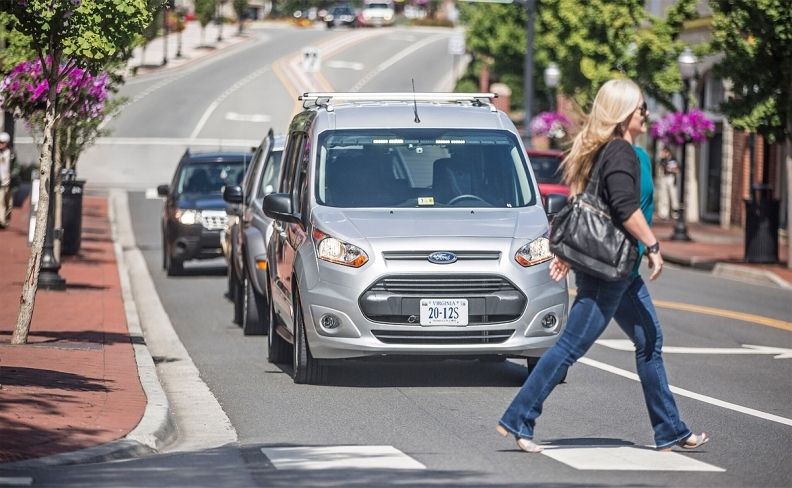 Ford partnered with the Virginia Tech Transportation Institute in August to test how people reacted to a self-driving vehicle signaling its intent. 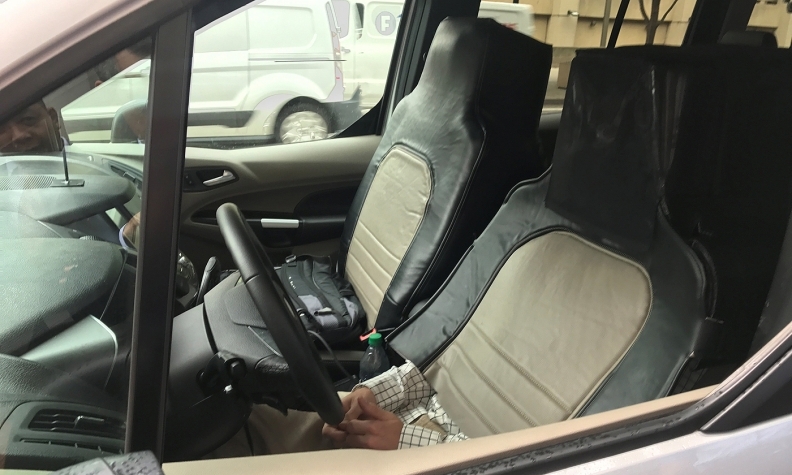 Ford disguised drivers by outfitting them with a costume that looks like a seat and headrest to make it appear to outsiders that the vehicle was being driven autonomously. Ford disguised van drivers by outfitting them with a costume that looks like a seat and headrest to make it appear to outsiders that the vehicle was being driven autonomously. A Ford test van was outfitted with six high-definition cameras to provide a 360-degree view of surrounding areas and capture the behavior of road users. More than 150 hours of data was collected, with external signals activated more than 1,650 times in an urban environment. The van drove about 1,800 miles, Reuters reported. Ford has held workshops with other automakers, the International Organization for Standardization and SAE International in hopes of achieving consensus on a global standard that all companies adopt, Shutko said. “We all agree that the biggest failure mode would be if different [automakers] came to market with different strategies for this,” he said. Ford paid for the research, but wants to share the results with other auto manufacturers and universities to develop a final standard, Shutko said, adding the company welcomed collaboration with competitors.